One hundred and fifty years ago, our Republic saw the end of five years of hostilities which left us riven and bleeding. 970,000 Americans (north and south) perished across these five April's. It took close to a century for some parts of our nation to recover from the physical effects of combat, deforestation, and troop concentrations as the battle lines moved north and south over those five years. Even so, though two sides cast their lots, our Lord declared the outcome; The Confederate States of America were defeated and the the Union was reconstituted. Despite this, there were those who would refuse to acknowledge the defeat of a cause and would engage in in guerrilla warfare against not only those working towards reconciliation, but people of color and differing faiths. These individuals cherry-picked a banner from a lost cause, the battle flag of the Confederate Army of Northern Virginia to serve as their banner to rally their troops in the oppression of a people. We fast forward now 150 years to a time where people of good will striving to finally bind the wounds of a century & a half ago. 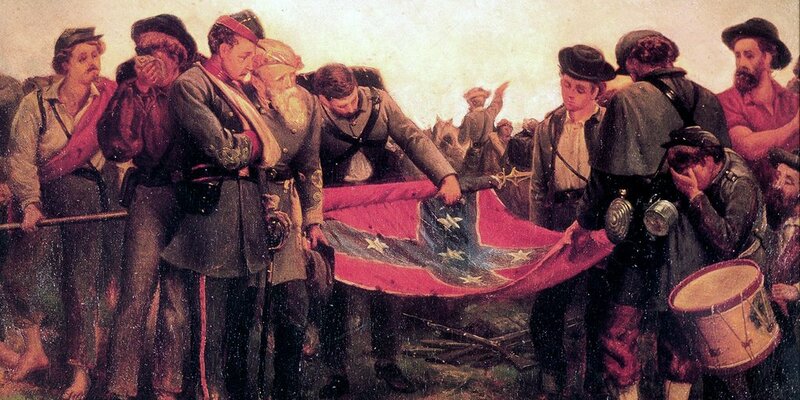 If our Republic is to truly move forward, this Banner of oppression (the battle flag) needs to be permanently be retired and the Democrats who used it as a Shibboleth for a Century, (Fritz Hollings, Jimmy Carter, Bill & Hillary Clinton, Al Gore) need to come forward and acknowledge their identification with it and to denounce it. As to the flag, its high time those colors are once and for all retired. Think about it for a moment; do German's fly the Nazi-era flag as it's an (unfortunate) piece of their heritage? No, flags like these are only flown in the name of hate. Therefore, if food makes my brother stumble, I will never eat meat, lest I make my brother stumble. I Cor 8:13 . Wise Counsel from a Smart man.